The Real Food Academy is dedicated to making your child's cooking class an Unforgettable One! If your child loves to eat and have fun, we want them enrolled in our Miami Cooking Classes for Kids! Every Saturday, your kids will come back with big smiles on their faces and little bit more knowledge about how to distinguish “real food” from “food-like” products. We only use all natural and healthy ingredients in every dish, hence our slogan: "We Don't Change the Dish....We Change the Ingredients!" The menus for our kid-friendly cooking classes are designed to re-introduce your child to some of their favorite meals but with healthy alternatives. We call this the “secret ingredient method”, which helps kids make food breakthroughs that have them saying, “I Tried and I Liked It”. Our Saturday cooking classes have taught us that when kids are involved in the preparation of their own meal, they will try...and actually like foods they would not have otherwise given a chance. Some parents wait for their little chefs-in-training at the brand-new café just steps away from our Miami kids’ cooking classes. Enjoy a healthy bite to eat or a delicious espresso before you see what your child has created this time! 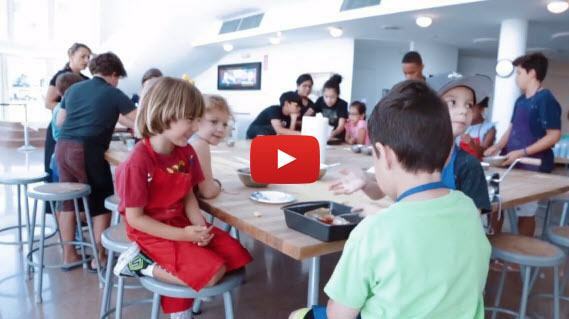 Want to learn more about our cooking classes for children in Miami? Reach out to us at (786) 395-0355 today! We offer cooking classes for children ages 4 to 14. Single Classes cost $35 ... or you can save BIG when you buy a 10 Class Package for only $250. Booking a cooking class is easy using our online booking system. Please Note: We've been doing this a while. As a result, we've answered almost every question you might have. Spend about 5 minutes reviewing the FAQ, and we promise, you'll understand our process, what to expect, what's next, and how to get started. Thanks for taking the time. Click One Of The Buttons To Start Booking A Class! We built a custom reservation system, which you can access by clicking either of the buttons to the right. Next, you will choose the Saturday you want to attend. Complete the forms and check out to complete your booking process. Feel free to contact us by phone at (786) 395-0355 or by email here if you encounter any issue during your booking.